K2 photometry of K2-nnnA: (a) immediately after extraction from the pixel-level data; (b) after removal of systematics, showing the stellar variability; (c) after smoothing and detrending, with vertical ticks indicating the locations of transits; and (d) the phase-folded photometry with the best-fit transit model fit to the light curve. The feature at time index 3033 is a residual systematic induced by K2’s motion. Image credit: Ciardi et al., 2017. (Phys.org)—Using NASA's prolonged Kepler mission, known as K2, astronomers have discovered a new Neptune-sized planet in a binary star system in the Hyades open cluster. The newly found exoworld, designated K2-nnnA b, is the first known Neptune-sized planet in a binary system within an open cluster. The finding was reported Sept. 29 in a paper published on the arXiv pre-print server. K2-nnnA b was initially spotted during K2's Campaign 13, conducted between March 8 and May 27, 2017. During this campaign, a team of astronomers led by David R. Ciardi of the California Institute of Technology (Caltech) observed a binary system named EPIC 247589423 consisting of a K-dwarf star and a late M-dwarf companion. 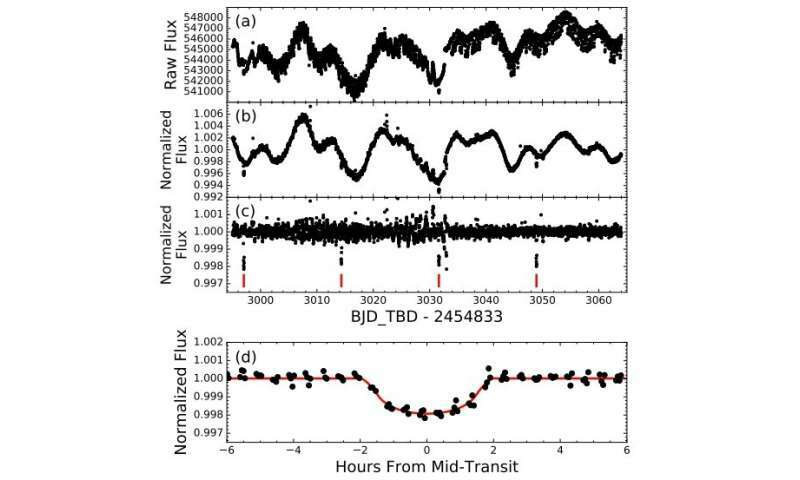 As a result, the researchers identified a transit signal in the light curve of the binary. The planetary nature of this signal was confirmed by follow-up observations using several observing facilities, including Palomar Observatory in California, the NASA Infrared Telescope Facility (IRTF) and the Keck Observatory, both located in Hawaii. The new observations were also complemented by archival imaging data from the Palomar Observatory Sky Survey (POSS). "The detection was made with K2; we have performed a suite of follow-up observations which include high-resolution imaging and spectroscopy," the paper reads. According to the study, K2-nnnA b is three times larger than Earth and orbits its parent star every 17.3 days. The planet's host is a bright star of spectral type K, designated K2-nnnA, about 30 percent smaller and less massive than the sun. The planetary system is located approximately 180 light years away in the Hyades open cluster – the nearest star cluster to the sun. Besides spotting the new planet, Ciardi's team also found the parent star's companion named K2-nnnB. The observations show that it is a star of M type separated from the primary star by at least 40 AU. The newly detected planet is the first Neptune-sized planet to be found orbiting in a binary system within an open cluster. The researchers also noted that K2-nnnA b is the fourth exoworld discovered in the Hyades cluster, and only the second transiting planet in this cluster. The first transiting planet found in the Hyades cluster, known as K2-25b, is also a Neptune-sized extrasolar world and orbits a relatively low-mass star, just like K2-nnnA b. In concluding remarks, the astronomers emphasized the importance of their discovery, saying that finding new alien worlds in star clusters could provide important hints about the formation and evolution of planetary systems. "By finding and studying planets in clusters spanning a range of stellar ages, we may begin to understand how and on what timescales planetary systems form and evolve. (…) As we begin to understand the planetary distribution in the nascent clusters in which stars and their planetary systems are born, we can begin to set constraints on and understand how planetary systems form and evolve into the systems we see today in the field of stars," the scientists wrote in the paper. We report the discovery of a Neptune-size planet (R_p = 3.0 R_Earth) in the Hyades Cluster. The host star is in a binary system, comprising a K5V star and M7/8V star with a projected separation of 40 AU. The planet orbits the primary star with an orbital period of 17.3 days and a transit duration of 3 hours. The host star is bright (V=11.2, J=9.1) and so may be a good target for precise radial velocity measurements. K2-nnnA~b is the first Neptune-sized planet to be found orbiting in a binary system within an open cluster. The Hyades is the nearest star cluster to the Sun, has an age of 625-750 Myr, and forms one of the fundamental rungs in the distance ladder; understanding the planet population in such a well-studied cluster can help us understand and set constraints on the formation and evolution of planetary systems.